Each individual application will run in its own separate window. There is no main root window. The application looks contains its own windows title bar and can be moved and resized accordingly. Note: XDMCP sessions always run in single window mode. There is no multiple window option for a default XDMCP session. Panning allows windows that appear partially off screen in Multiple Window Mode to be gently nudged back on screen. When a window is off screen, move the cursor into the region of the X window and press against the edge of the screen. The window will slowly move back on screen. Notifies the remote host that X-Win32 can accept the default color options of applications that use Xresources. Uncheck if you have set up your own custom color resources in the .Xresource file. Single Window mode launches a root window defined by the height and width in the Geometry section of the single Window tab. All connections will launch in this main window. In order to move or resize the applications displayed in single window mode, a window manager (such as twm, gnome-wm or kwin) needs to be running. Typically, single window mode is only used to display a full remote desktop. window as specified by the Height and Width options in the Geometry section. but still show the task bar. All screens are contained in one window and can be switched by clicking on the tab with the screen number you would like to view. On systems with multiple monitors this option allow single window to be sent to a monitor specified by the number, or to span all monitors. The maximum number of monitors is dependent on the local workstation and its Windows operating system. Windows provides the numerical identification of each monitor, in Display Properties. By default, X-Win32 uses the RANDR extension to resize a single window. Certain applications do not behave correctly with the RANDR extension. The "Use Scrollbars" option adds scrollbars to the single window allowing the viewable area to be resized and shrunk as needed but still maintaining the X applications original size. The X Server will run in 8 bit only mode. There is no 24 bit TrueColor. Some X-applications may request backing store on windows that are complicated to draw, which can slow down the response of the display. When a window is obscured, hidden behind another window, it must be redrawn when it is returned to the front. When cached, CPU usage is significantly decreased, and display time is accelerated. Disables the feature. Information of the windows will not be saved. Only uses backing store if the X application requests it. This is the default setting. Causes the X server to use backing store on all windows, even if the X application does not request it. This is recommended for slower network connections, such as dial-up. There is an overhead on certain line drawing operations which will cause a slowdown. Turn this feature off if you are experiencing a slowdown with your application. This option is only available on Vista SP2 with the Platform Update and Windows 7 machines. Other users will default to a nonaccelerated rendering engine. 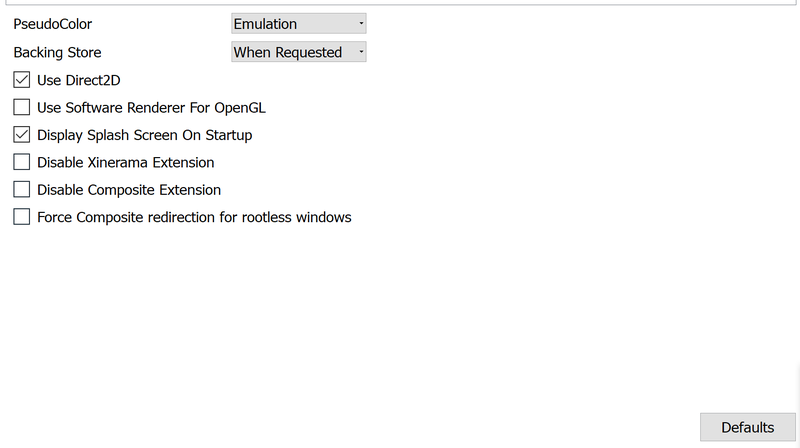 this option to use the OpenGL rendering as provided by the Windows software. On certain Solaris machines and Gtk+ based applications, the Xinerama extension causes issues with mozilla and CDE. Check this box to disable the Xinerama extension if you are having issues with your windows or menus appearing in odd places.. 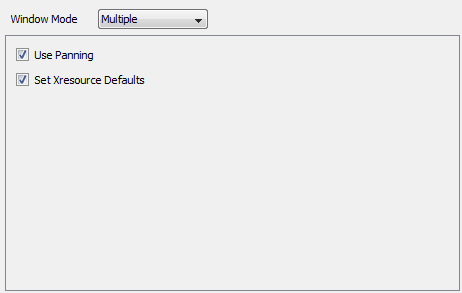 This option turns off the Composite extension used for layering windows. Check this option if you are having issues with legacy applications redrawing properly. This forces the window to use composite redirection that would skip a couple layers for rendering into the composite off screen pixmap. It is then copied to the rootless off screen pixmap before the server blocks for more network input. This comes with a higher memory usage since the server has to maintain a second off screen buffer for all top level windows and some extra cpu cycles to copy the screen contents to the rootless buffer.